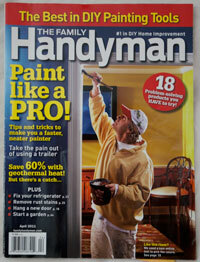 If you don’t paint every day, “cutting-in” a room can be frustrating. The Accubrush edge-painting tool is one of the best we’ve tried. It makes cutting-in quick and easy. With just a little practice, you can paint perfectly straight lines along ceilings and moldings. Accubrush will save you hours of work and frustration by doing what has traditionally been the most time-consuming part of painting. Watch the video and see how your time savings can add up! When you paint, one of the toughest things is to get a really clean line. and it takes forever. So, I have here a product which is called the Accubrush. And this will help you cut around doors, window frames really quickly, What works incredibly well is this beautiful little brush here. You have to hold it flat against the wall. And it does end up cutting in really beautifully. The best paint edging tool I have seen on the market so far. First of all, the Accubrush is a roller, not a slab of foam. You roll the rest of your walls, why not the edges, too? It's a logical assumption. Next, Accubrush employs a metal edger device to keep the line razor sharp. On the fancier Accubrush XT model, this edger even moves up and down to accommodate slight bumps and imperfections the tool may encounter on the wall. Wheels on the tool also ensure that the tool rolls along, rather than slides along. But the killer feature is the removable nylon-bristle brush that follows right behind the rollered line, to keep the paint sharp and neat. The Accubrush XT or MT would make great gifts for any painters you may know--amateur or professional. If you're looking for an alternative to taping up an entire room before painting, check out the Accubrush. It's designed to make cutting in edges quicker and easier. The Accubrush rolls like a roller but cuts like a brush. The no-smear shield keeps paint off the surfaces that you don't want to get painted. And to get into the corners between the ceiling and the wall, you can mount the swivel handle on a pole to give you the reach. Nobody says painting has to be fun. But with the Accubrush, it doesn't have to be time-consuming either. 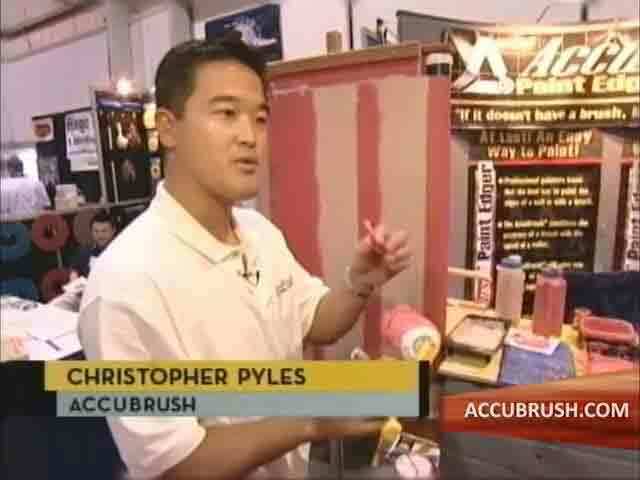 In this video, Accubrush Inventor Chris Pyles explains how the patented combination of a roller, shield, and brush work together to quickly paint straight lines along the edges of walls and along trim. Roller holds a lot of paint, allowing you to paint 6-8 feet per load. Fine-Line Brush Paints precisely to the edge. No-Smear Shield keeps paint off the trim and adjacent walls. Brush Adjuster allows you to adjust the line as desired. Watch the video and see how this revolutionary technology can help you get a better paint job! Edge up to ten feet with a single load of the roller. The small fineline brush moves the paint to the very edge of the wall, ensuring a perfect line every time. Specially-Designed Shield ensures that your trim stays free of paint. Professional Pole-Mountable Model can be mounted on a pole, making it a breeze to paint a straight line along the top of the wall. No more worrying about paint bleeding under the masking tape! Brush adjuster allows you to move the brush in or out to give you a perfect edge in a wide variety of different situations. With our Professional Pole-Mountable unit, your feet stay firmly on the ground while you paint the top of the wall! Need A Straight Line Against the Ceiling? Ceilings are the most difficult parts of painting. They require a lot of ladder work and you are often holding the brush above your head for long period of time. Many times, masking tape won’t stick properly to a ceiling, and paint often bleeds under the tape. Professional model can be mounted on any standard paint pole up to 20′ long. Keep your feet on the ground and edge the top of the wall. Eliminates 90% of the climbing up and down the ladder. Great for angled, high, and cathedral ceilings. Watch the video and see how the Accubrush can be used against ceilings and crown molding! Makes it easy to use multiple colors on your walls. Allows for more complicated color schemes. Change Color Schemes more often! You might have ambitious color schemes in your head — perhaps using two or more different colored walls in the same room — but are worried about the additional time it will take to paint multiple colors. Don’t worry — watch the video and see how Accubrush can help you unleash your inner designer and get the look you’re really dreaming of!